Designed for test and maintenance departments working in industrial or administrative buildings, the Qualistar+ C.A 8331 can be used to obtain a snapshot of the main features characterizing the quality of the electrical network. Easy to handle and particularly compact, this instrument also offers a large number of calculated values and several processing functions. 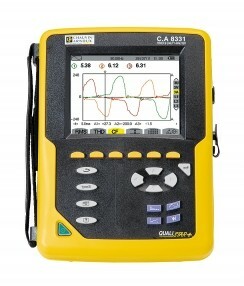 The C.A 8331 is equipped with 3 voltage measurement channels and 3 current measurement channels. When the current sensors are connected to the C.A 8331, it recognizes them automatically. It also offers the possibility of mixing different types of current sensors and configuration of the ratios allows direct reading of the measurements. The multiple functions of the Qualistar+ C.A 8331 make it particularly versatile. It is suitable for applications up to 1,000 V in CAT III and 600 V in CAT IV. The measurements obtained with the Qualistar models can be processed using two software tools: PAT delivered as standard and Dataview®, available as an option.